Carole’s mission is to eliminate resistance, uncertainty, and fear by speaking to visionary leaders, individuals experiencing change, and teens with depression so that they are able to identify their purpose and achieve their highest potential. Change is what we do the most and teach the least. The shift has occurred. We have moved from seeking outer experts to accessing inner knowing. 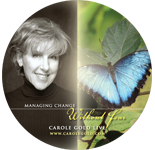 Through speaking engagements, seminars, workshops, CD’s and one-on-one coaching, Carole is your guide through fearless change. Carole’s gift is in teaching others how to “get comfortable with being uncomfortable” with the twists and turns of their particular Life’s path. Carole speaks to students on the topic of depression and attempted suicide. Her mission in sharing her story is to bring hope and confidence to young people. The Lightworker’s Handbook is a simple explanation and user-friendly guide to navigating the changes taking place around you. Not only does the book succinctly lay out what is unfolding globally, it also makes your role in it all crystal clear. Find out why you may be feeling alone, and how you are connected to a network of Lightworkers that serve as both your reflection and your strength! Carole has spent many years and countless changes in her own life perfecting an understanding of fear, and how to use it to your advantage. The Relationship Gap Survey© is a simple questionnaire designed for married couples or those intending to make a long-term commitment in or out of marriage.